As I was neither constrained to use certain components or materials, nor to meet any restrictions with regard to costs and time, I did not have to make compromises when developing this subwoofer. As driver unit only first-class products of renowned producers ought to be used, which are known for their reliability and can be repaired if necessary. With the help of efficient simulation and measuring software a big number of possible approaches was optimised until no further improvement was possible. All these results were carefully compared to each other. By carefully considering the respective advantages and disadvantages it was tried to find the solution which would yield the best and most balanced final result. A big vented box (bass reflex) with a single, but enormously robust and powerful and above all acoustically outstanding 24-inch-driver (ELODIS-SUB-VB24) respectively a 21-inch-driver (ELODIS-SUB-VB21) eventually proved to be the best and most balanced solution. As a result the best ratio between enclosure size, achievable sound level and power demand could be achieved. To implement an enclosure that does not have an impact on the sound quality it is necessary to use suitable materials and stabilisation measures. Panzerholz® (Pressed wood) for the enclosure and aluminium for the bracing proved to be the ideal materials. 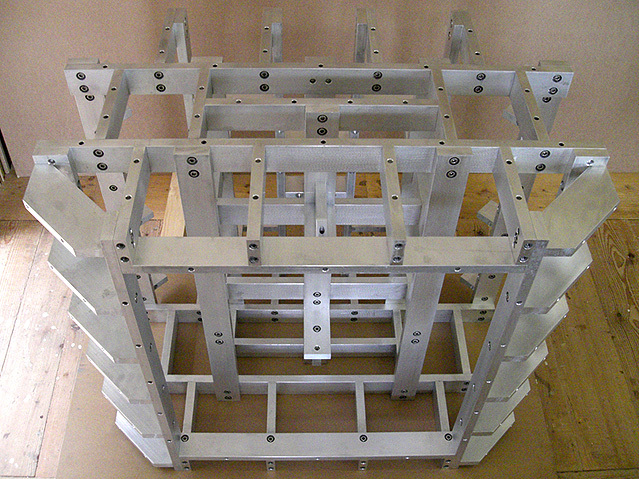 With a particularly stable aluminium frame (110 kg), which at the same time serves as bracing for the enclosure components, all parts of the enclosure as well as the aluminium frame itself are screwed together with M8 screws (about 700 screws and the same number of threaded Ensat bushings) and are carefully sealed. As a result complete non-destructive disassembly of the subwoofers would be possible if required. This might offer very interesting possibilities in case of upgrades. The result of this design is an incredibly stable construction which is poor in resonances, nearly totally sound-tight and remains permanently stable if implemented correctly. All fasteners (screws, bushes etc.) are made of stainless high-grade steel. The use of these materials allows a comparably efficient material use and the achieved acoustic advantages would hardly be achievable with conventional materials such as MDF or multiplex, not even when using considerably higher wall thicknesses. Pressed wood in the used quality is about 20 times more expensive than MDF and nearly 10 times more expensive than multiplex boards of the same thickness. Pressed wood is an extremely hard multi-laminated material in sheet form. 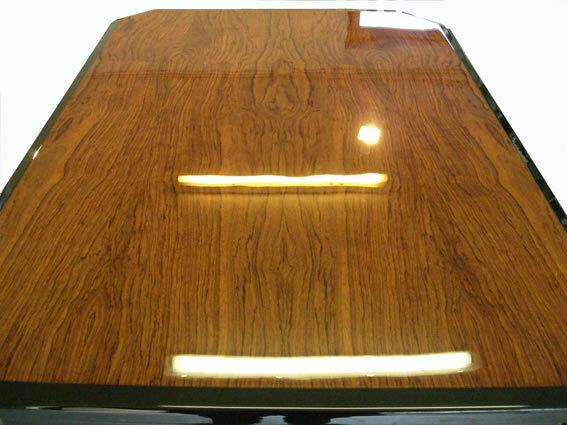 It is manufactured from beech veneers and phenol resins under high pressure (approx 40N/mm2) and heat. The measured value for the enclosure losses QL (enclosure leakage losses) is at least 50 when using an undamped enclosure, which considering the big enclosure dimensions is an astonishingly high value and a clear metrological indication for an acoustically totally neutral enclosure. The used pressed wood has substantially higher strength factors than the materials that are commonly used even for very expensive speakers, such as MDF, HDF or multiplex, while at the same time achieving excellent vibration absorption. implementation of a sufficiently big cross section area of the bass reflex ports despite the big interior volume, which even at full load do not cause any turbulent flows in the channels nor audible turbulences at the output ports. Both the cross section areas of the 12 individual ports and the rounding of the output ports were dimensioned exactly in a way that could meet this requirement. Furthermore, despite the length of the channels, no peculiar channel resonances (standing waves) that might have impacts on the sound quality can be seen in the impedance graph due to special channel shaping. A very special and targeted damping inside of the enclosure eventually guarantees that the standing waves occurring in the interior of the rather big enclosure are suppressed effectively wherever necessary, without increasing the enclosure losses that are nearly undetectable and therefore acoustically hardly relevant anyway. Amongst others this can only be seen from the impedance peaks that are reduced by less than 5% and an impedance increase by 0.1 Ohm at tuning frequency compared to the undamped variety. For the interior cabling high-quality big-section silver cables from Van-den-Hul are used. The connecting panel is equipped with M8 brass screws. The first acoustic and metrological test runs justified in an impressive way the high material and manufacturing expenses. The result is an absolutely realistic and natural reproduction of low frequencies, which are completely free from any kind of enclosure noise. It particularly stands out that the high acoustic performance is always available to the same extent regardless of the selected volume. This means pure listening pleasure, in which the technology involved, stays in the background. Practical experiences have repeatedly shown that such a realistic sound reproduction is not achievable with compact constructions. These have to compensate the inevitably missing degree of efficiency in the low-frequency range by means of particularly high diaphragm excursion and very high power demand, which leads to limited dynamics, higher distortion and a shorter lifetime of the drive unit. The subwoofers are particularly suitable for use in systems which include a central control unit that controls the entire system and adapts it to the room. Adapting only a single component of the system such as the subwoofer to the room and the system is and cannot be a perfect solution, but just a provisional one. Therefore this subwoofer is not equipped with any amplifier or filter circuits. As a result the user has the possibility to use either existing electronics or electronics that are recommended or seem to be most suitable for this purpose. To be able to make full use of the efficiency of the subwoofers, powerful outputs with a high damping factor are highly recommendable. For this purpose high-quality PA power amplifiers are recommended. These yield a very high sound quality and furthermore offer comprehensive safety switching and protective circuits. Especially circuits to limit the maximum output power or output voltage may prove as useful protective measures to protect the speaker from destruction. When choosing the place where the subwoofer is to be positioned, it is important to bear in mind that the site should meet all static requirements with regard to the high weight of the device, and in addition should be as little vibration-prone as possible. For a precise bass reproduction the bass driver must be fixed to its place in such a way that it cannot shift when the diaphragm oscillates. The high weight of the subwoofer and its optimal connection to a stable, non-oscillating site are the most important requirements to be met in order to achieve the desired bass reproduction quality. Decoupling the subwoofer from its site by means of vibration absorbers or a vibration-prone site may cause imprecise bass reproduction. The height-adjustable legs with which the subwoofer is equipped guarantee an accurate connection to a suitable site. ELODIS-SUB-VB-24 is no longer manufactured as future availability of the used bass drive unit is not guaranteed any longer. 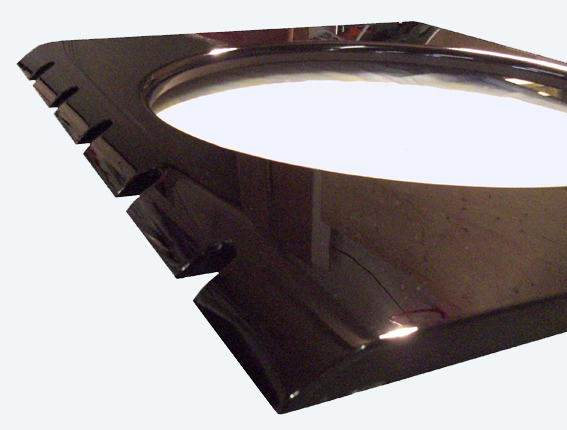 All ELODIS-SUB subwoofers excel through their extremely low distortion and minimum enclosure losses. ELODIS-SUB-VB21H yields a maximum acoustic pressure that is 3 dB higher than that of ELODIS-SUB-VB21L as it renounces a very low cut-off frequency. A feature that stands out in both varieties of the ELODIS-SUB-VB21 is the particularly low power requirements that are necessary for reaching the maximum acoustic pressure level (about 500 Watt at X-max). The result is a particularly low dynamic compression, while allowing at the same time to choose from a wide range of amplifiers. With ELODIS-SUB-SB218 a compact alternative to the big bass reflex models will be available soon. ELODIS-SUB-SB218 is based on a closed enclosure which is equipped with 2 of the best 18-inch bass drive units that are currently available. These work in 2 separate chambers thus enabling stereo operation. A more compact enclosure, however, means higher power requirements compared to the bass reflex models (about 2000 Watt at X-max). Due to the capacity of the used bass drive units it would be impossible to implement a sufficiently loss-free bass reflex model for the enclosure size of ELODIS-SUB-SB218. The equipment of the subwoofer with two 18-inch bass drive units guarantees that very high sound pressure levels are still possible even at very low frequencies (about 20 Hz). In music systems the crossover frequency is selected according to the used main speakers. To protect the speakers from mechanical destruction a subsonic filter must be used. The ideal crossover point and filter order may vary individually according to the use and positioning of the subwoofer in the listening room and therefore can only be optimized after delivery and set-up of the subwoofer.